It’s time to go hiking in the stunning scenery of Northern Sweden and Norway! The Hiking Routes of Northern Scandinavia is a comprehensive guide for anyone who has dreamt of hiking in the breathtaking mountain vistas and wilderness of Scandinavia. The book provides descriptions of over two hundred hiking routes; the easiest one is a 500-metre trek to the sea down a forest road, and the most demanding is a 70-kilometre fell hike. The routes in the book are constructed in legs, which enables everyone to construct suitable routes for themselves. 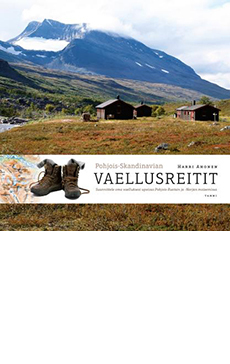 The book also includes basic information about hiking in Sweden and Norway, providing details on hiking cabins, travelling, the different hiking seasons and other practical aspects. Hiking has been increasingly popular in the Nordic countries throughout the last decades. Because there is a broad selection of routes and treks, this guide is suitable for various levels of hikers from beginners to experts. The levels and points of interest are clearly noted. The photography showcases the nature and breathtaking views of the area. Ahonen’s next book The Hiking Routes of Central Scandinavia was published in 2016.